Just got back from Chicago where Story Circles co-producer Jayde Lovell and I launched the postdoc-level prototype of Story Circles. This one is being sponsored by the NIH/University of Chicago My C.H.O.I.C.E. program. 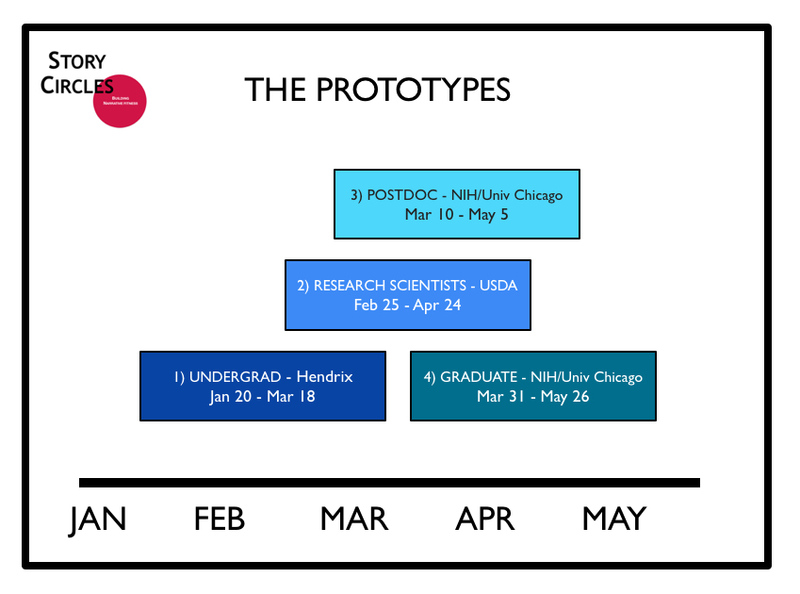 I’ll return in three weeks to launch the grad student prototype. In the meanwhile, next week will be the 10th and concluding session of the undergrad prototype at Hendrix College where five brave and intrepid students, in addition to enjoying it, are now changed for life. Never again will they bore or confuse anyone. Hopefully. They also had a lot of fun. OPERATION STORY CIRCLE: Five people, one hour a week, ten sessions. That’s what each circle consists of. We liken it to fitness training. We give you the narrative tools on the first day, you just do weekly one hour workouts consisting of analyzing research abstracts with the tools, then work on your own stories with them. Almost no homework. Pretty much the same as going to the gym, just a different set of muscles you’re working out. COMPASSIONATE COMMENTATOR: There’s no need to suffer narrative deficiency alone any more. A cure is here. It’s called Story Circles. It’s fun, it’s painless and it works. Ask your doctor about Story Circles today. That’s going to be the tagline eventually for our TV commercial for Story Circles when that day arrives. For now, it’s time to start spreading the word — Story Circles works. With Story Circles (sounding like an infomercial again, sorry) you’ll never look at content the same way. It’s true. How can it not be true. There simply aren’t any tools for simple structural analysis of narrative. Now there are. We can see it in the undergrad prototype group at Hendrix College in Conway, Arkansas. Two months their analysis of content was little more than, “It’s not very well written — kind of clunky, doesn’t flow, didn’t grab me, too wordy.” Inarticulate, mostly just gut level analysis. Now they have specific vocabulary to analyze structure analytically. They have a whole page of terms and templates, most of which can be found in my last book, “Connection,” all of which will be found in my new book in September. Big things lie ahead for Story Circles. For now we need to finish the prototypes and analyze them properly (everything is being videoed). This will give a clear picture of how it works and what can be expected. Then we’ll be ready to release it widely.